We previously met Guishan (771-853, 10th Gen., dharma grandson of Mazu) in GG #40, BCR #70, BCR #4, BCR #24 (BOS #60), and BOS #15. Guishan was a disciple of Baizhang and thus a dharma brother of Huangbo. Guishan (from Mt. Gui) and his disciple, Yangshan (807-883, from Mt. 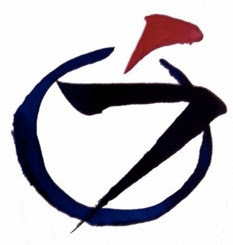 Yang), are the founders of the Gui-Yang House, one of the fabled "Five Houses of Zen." We first saw Yangshan in BOS #72, and he also appeared in BOS #15. One of the distinguishing features of the Gui-Yang House "was that it carefully considered both sudden enlightenment and the gradual cultivation of it, not getting caught up in the 'sudden versus gradual' dispute that was popular at the time. Seeing clearly is one thing, the Gui-Yang School teaches, but integrating it into your life is something else. Insight is sudden, integration is gradual" (Wick). Guishan asked Yangshan, "Suppose a monk asks you, 'All sentient beings have unceasing karmic consciousness [active consciousness, boundless and unclear], but there is no basis [no fundamental] on which to depend.' How would you examine that monk? [How would you prove it in experience?]" Yangshan replied, "If this monk were to come, I would call him by name, saying, 'So-and-so!' If the monk turned his head, I would say, 'What is that?' I'd wait for him to hesitate, and then say to him, 'Not only is karmic consciousness unceasing [Not only is their active consciousness boundless and unclear], there's also no basis on which to depend [they have no fundamental to rely on].'" Taking out the farmer's ox, lead him by the nose. Snatching food from a starving man, clasp your hands around his throat. Is there any one who can mete out such poisonous means? Call once and he turns his head: Does he know the self or not? The full moon imperceptibly turns to a crescent. the road of poverty subtly brings grief. One call and he turns his head -- do you know the self or not? Vaguely, like the moon through ivy, a crescent at that. On the boundless road of destitution, has such sorrow. A monk asked Yunan (1025-1102, 19th Gen.): "The Treatise on the Flower Ornament says that the fundamental affliction of ignorance itself is the immutable knowledge of all Buddhas; this principle is most profound and mysterious in the extreme, difficult to comprehend." Yunan said, "This is most distinctly clear, easy to understand." At that moment a boy happened to be sweeping there; Yunan called to him, and the boy turned his head. Yunan pointed to him and said, "Is this not immutable knowledge?" Yunan then asked the boy, "What is your buddha-nature?" The boy looked around, at a loss, and left. Yunan said, "Is this not fundamental affliction?" The boy turning his head is just like Yangshan calling a monk and the monk turning his head. The boy's bewilderment and the monk's hesitation are no different. The fundamental affliction of ignorance and the boundless unclear active consciousness are also the same. Yunan's boy and Yangshan's monk both had thoroughgoing immutable knowledge -- and Yunan and Yangshan themselves both had boundless active consciousness. Unceasing karmic consciousness: Karma is the law of cause and effect. As long as we have a body and a mind, we are subject to karmic causation, and there are karmic consequences of everything that we do. If we put a hand in the fire, it burns and hurts; if we work hard, we can earn money with which to live. What we think, what we believe, and what we say are also subject to karma. That is karmic consciousness. No basis on which to depend: We imagine that if we do certain things we should get certain kinds of rewards. But that isn't always the case, is it? Why? Because there is no basis on which to depend. Sometimes righteous people come to grief and evil people prosper. What is the one small rope that holds us back? Always, it comes down to one thing: self-grasping ignorance. We dearly want to find some fixed thing we can grasp in ourselves. We keep looking for something to make us secure or to make us special. Yet, there's no basis upon which to depend. When we stand, we stand. When we sit, we sit. No basis on which to depend. You have to let go of all your ideas about original self. The original self isn't something out there that you will find. The original self is always right where you sit, but it's covered over with all kinds of notions, beliefs, opinions, and judgments. What are you holding onto, right now? What is there when you let go of that? If I call your name, and say, "What is it?" what do you see? What do you feel? "Call once and he turns his head." Right there, it's manifest. If you blink your eyes, you miss it. Just keep watching. Keep attentive. Don't let down for even a moment. Falling into your old patterns and old habits, just notice! Just watch! Be aware! "What is it?" When the head turns, the entire, true human-body turns. Is this to be eaten or is it just the play of light? Is it the immutable wisdom of the Buddhas? Is it the fundamental affliction of ignorance? Hey, girl. Do you know the self or not? the vetch and bell-beans tangled in the fallow fields. Here the violets push up amid the fallen sycamore leaves. There the onion flowers and forget-me-knots bloom side-by-side. Karmic consciousness is a result of past actions conditioned by delusion. Delusion exists as a result of consciousness; consciousness results from ignorance; ignorance is dependent on mind. Yet mind is originally pure. It has no origination or cessation. It is without doing or effort, without karmic retribution, without superiority or inferiority. It is still, serene, and intelligent. We should understand that one's original, unchanging self-nature is neither holy nor profane, neither deluded nor enlightened. The delusions or ordinary beings and the enlightenment of the buddhas are one reality, which has nothing to do with the sense or its objects nor mind or its environment. This being the case, tell me, what is it that Yangshan uncovered when he examined the monastic that caused Guishan to say, "This is a drop of lion's milk that splatters away six gallons of donkey's milk"? Haven't you heard of the ancient who hung a signboard at the gate that said, "Beware of dog. On top he takes people's heads, in the middle he takes people's midsection, at the bottom he takes people's legs. Hesitate and you are lost." As soon as he saw a newcomer, he would shout, "Look out for the dog!" The moment the visitor turned his head, the master would return to the abbot's room. This koan too is like that. in a flock of seagulls. Fully manifesting the entire universe of karma right where you are. Fully manifesting the entire universe of karma right where everything is. Fully manifesting the entire universe of karma right where it is.